By Default, Blogger provides its pageviews tracker and show stats of all time, monthly, weekly, daily or realtime.. It offers you all the info about the pageviews whatever system or perhaps browser your visitors are utilizing, from which often country they belongs to etc. But the catch is that additionally, it tracks your own pageviews also. Being a blogger, you might visit your blog at most 50 times each day, so this gets difficult to have your accurate measurement of pageviews. To have accurate statistics of your blog, you have to stop tracking your own pageviews first. So today I am going to show you how to stop tracking your own pageviews in your blogger blog and get accurate traffic stats of your blog. So lets start the tutorial. How to Stop Google Analytics From Tracking Own Pageviews? 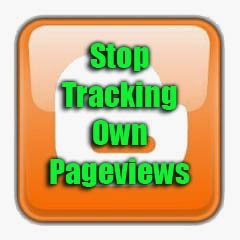 Click on Don't track your own pageviews button under your Blog's Pageviews statistics. A Popup will open and from that popup make on Don't track your own pageviews. 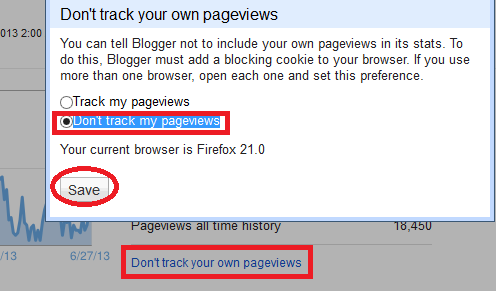 Note: Now blogger will stop tracking your own pageviews for the browser you are using at the moment but it'll track your pageviews when you visit your blog from another browsers.